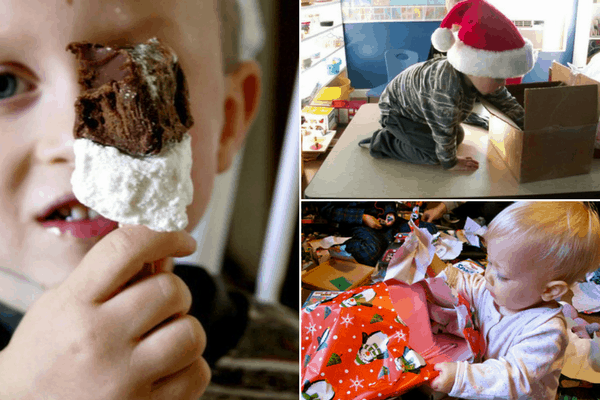 But just because you may be broke or need to plan Christmas on a budget- that doesn’t mean you can’t give your children the best Christmas ever! How to Give Your Children a Magical Christmas— Even When Money is Tight! No Money for a Tree? No matter. When I was a kid we had a large potted ficus tree in our house. One year (or maybe a for a few years) we decorated that ficus. 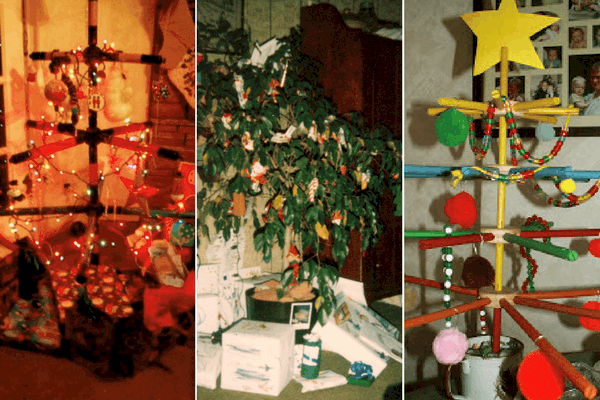 We covered it in handmade ornaments and the very few “real” ornaments we owned. And I loved it! Looking back, I am sure my parents couldn’t afford a tree, but to the 5 year old me- I thought it was pretty cool! Bust Out the Tinker Toys! When my boys were young, we were in need of a tree for a pre-Christmas get together and we didn’t yet have the funds to buy our tree. But we improvised and built one out of their very large tinker toy blocks! I thought it looked great once it was strung with lights and ornaments. If you don’t have tinker toys, maybe you have another toy that could be built into a “tree” I bet the kids would love the fact that they built the tree! Grab a large piece of paper or appliance box, whip out the green paint, and call the kids. Paint yourself a Christmas tree. Paste or tape real or drawn ornaments. You could even make this 3-d by cutting 3 or 4 panels out of the large appliance box and taping them into a triangle. This could be the making of a new tradition! Do you have access to woods? Take a walk and a saw and choose your own Christmas tree from the woods. It doesn’t have to be perfect and the memories made by choosing your own tree like this with the kids are priceless. There are millions of ways to fashion a tree! Just check out Pinterest for Christmas Tree Alternatives. I’ve seen anything from a ladder strung with lights to books stacked in a pyramid. Now, I know that kids LOVE gifts. But the real magic and the real memories lie in the traditions leading up to Christmas. Years from now when they look back they won’t remember the gifts as much as they remember things you did together as a family to celebrate the season. And you can make memories even when you are broke. When my kids were very young we did a yearly 24 Days of Christmas tradition. I made up a list for every day from December 1- 24th. On each day we did something special- if can be anything: making ornaments, art projects, homemade gifts or treats, paper chains, trips to see neighbor hood lights, hot chocolate and a holiday movie. Anything! But they will wake up excited every day to see what special treat is planned! (You can see some of my 24 Days of Christmas traditions on my personal blog). Take a trip to the library and get as many Christmas and holiday themed books as you can find. Then READ them all together. You can also get 24 of them and wrap them up in paper and let the kids unwrap one “gift” per day at bedtime. Ornaments are so fun to make and there are so many ways to decorate a tree or house for nearly free just using homemade ornaments. Bonus- the kids can give them to relatives as gifts. You can make ornaments out of egg shells, paper, glitter, beads, popcorn, homemade playdough or clay. Again- your imagination is the limit! Make special snacks- shaped breads, reindeer chow, decorated sugar cookies- or make pictures. These are so fun to create together and make great memories. Buy cheap frames and packaging at the dollar store and let the kids give out their special creations to family on Christmas morning. You can also fashion little gift boxes out of Christmas cards– they are the perfect size for a little treat or handmade ornament. Make morning traditions that don’t revolve around the opening of gifts. Bake a special breakfast. Have a special movie. book, or game that you do together. Have someone dress up as Santa or create a scavenger hunt for something special. Remember these traditions are things they will remember and carry on to their own children one day. The most stressful part of Christmas on a budget is wondering how to give your kids a magical Christmas morning when you don’t have the money for tons of gifts. First things first- if you usually swap gifts with the whole family, let them know that this year is tight and you will be focusing on the kids (both yours and your nieces and nephews). Here are some tips on how to create the illusion of a big Christmas even when you are on a tight budget. And I mean everything. Wrap everything in the stocking. Wrap every single hot wheels car. Every piece of a multi-pack. Every candy cane. If you start early- ideally a whole year before…but even if it’s just a couple of months, you can put aside a few dollars out of each paycheck and save them or buy items on sale. If you do this you can take advantage of sales throughout the year. Such as the back-to-school sale on crayons and markers and other art supplies. If you are thinking ahead you can get ahead of the stress of the whole holiday season. You will have a clear head and remember to do things like hold back a stash of Halloween candy to re-gift in the stocking or make something super special at home. One year when we had a tight budget and 5 kids to buy for I got together with a friend and swapped toys. We each had toys our kids had outgrown or we needed to reduce the amount to make room for new ones. So we swapped. If you are part of a moms group, church group, or even just a group of friends- get together with some old toys, books, and clothes and make the swap- each of you will come away with a stash of new-to-you gifts to wrap up for your kids for free! We give quite a bit of real and useful items as gifts. My kids’ stockings are mostly filled with fresh fruit (bought for cheap at our local Aldi) and things they need like toothbrushes and other toiletries. These are things they need anyway and your discount stores are a great place to stock up on them. Handmade is great- even when it comes to kids. If you knit or sew- make them something to wear or for their dolls to wear. Create a cookie or cake mix in a jar to make together. Make a huge batch of homemade playdough. Create a bowling game with some paint and recycled bottles. 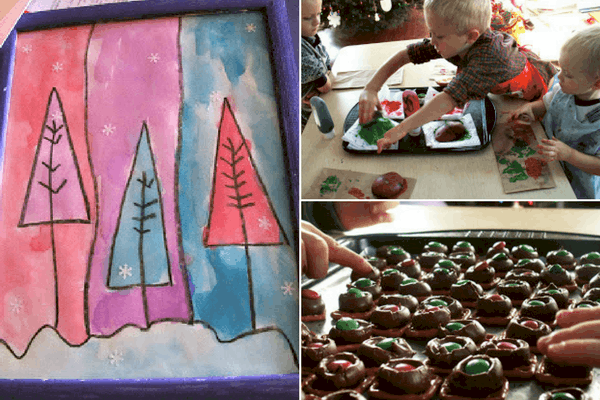 Check out this article from A Modern Homestead– she’ll give you a great list of homemade gifts you can make for kids that cost next to nothing- great for any family planning Christmas on a budget! Family gifts are a great way to give one present for multiple people. We always include a few gifts labeled for all the kids- these are usually games, movies, a baking mix, etc. Try to give things that can be used on Christmas morning for family fun. One thing we have done from a very young age is to keep the Christmas expectations low. We follow the little rhyme- Something you want, something you need, something to wear, something to read. Our kids know that they get 4 gifts from us and one from Santa and their stocking. Anything extra, is just that, extra. There have been plenty of years that the books come from the used book store, the clothes might be hand-me-downs, and the other gifts from the discount store. Teach your children to be gracious, giving, and find the joy in everything.